I take a slightly different approach to look at the relative value of stocks compared to historical norms, but reach the same conclusion as Dr. Schiller. 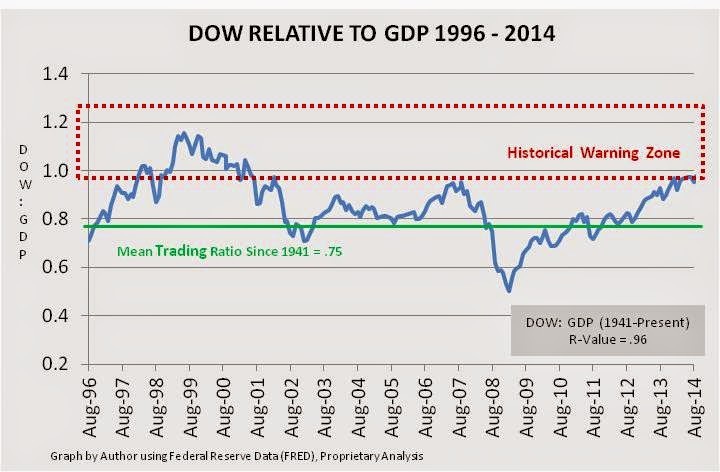 The analysis, as summarized in the graph below, simply looks at the ratio of the traded value of the DOW relative to the nominal GDP (stated in billions) during the same time period. Most recently the U.S. nominal GDP was just over $17.3 Trillion, and the DOW was trading at 17,098 at the end of August giving a ratio of .98. The ratio is functionally useful in highlighting periods when the market is in outlier territory. Presently, the stock market indices (DIA) (SPY) (QQQ) by relative measure are expensive. However, history has demonstrated stocks can trade at these levels for extended periods before a steep correction occurs. Since the 1990s, expensive in relative terms is a necessary but not sufficient reason for a major decline. Saying stocks are expensive is different from trying to assess whether they are at a peak, and a portfolio adjustment toward higher liquidity and lower risk is a good play. What is the likelihood that the S&P500 at 2000 is a peak? To make a reasonable assessment of this question, I do not know an accurate one statistic tells all model. 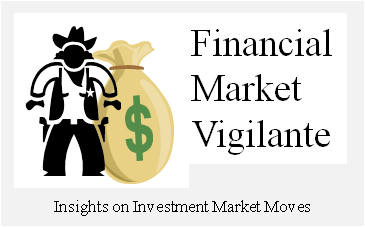 I suggest you must get a broad perspective of the most important factors that drive the flow of funds into investments, and assess the relative balance of major market forces to make a market peak assessment. For this purpose, I have developed a heuristic model which follows four major forces in the market to make the assessment – Fed Policy, U.S. Fiscal Policy, GDP Growth Sustainability and Energy Market Price Volatility. The remainder of this article assesses these four important forces at the end of August 2014 relative to their position in the market peaks of August 2000 and August 2007. Where will the Force come from? When the current all-time high stock market values are evaluated relative to four key market forces, Fed Policy, Fiscal Policy, GDP growth sustainability and Geo-Political Risk, the likelihood the market is setting a peak presently is moderately high, but not yet at warning levels. However, I think the risk is growing rather than decreasing based on the direction the relative forces are likely to move in the next year. Stocks are expensive, but have been at these levels in the past for extended periods before declining. Fed policy remains aggressively accommodative even with QE expected to end before year end. An inverted yield curve which typically foretells a steep market drop is not on the immediate horizon and there is still room for credit spreads to move to more typical warning levels. U.S. fiscal policy is currently a non-inflationary force, unique in the post WWII era. As the current low growth rate in Federal expenditures changes, pressure on the Fed to raise rates will grow, eroding the support of current “expensive” market valuations. Recent increased U.S. economic activity has been accompanied by relative debt levels returning to warning levels reached in prior market peaks in consumer, business and margin loan segments, with the exception of mortgage debt. However, at present the delinquency rates on the loan segments which are growing fastest are not indicative of pending economic strife, as was the case in the peak of 2000 in sectors such as telecom and just becoming visible in the mortgage sector in 2007. The chance of an energy sector oil price spike in the immediate future is considered a remote possibility in the U.S. market. However, the risk of an international supply disruption which could indirectly drive down the economy on a delayed basis is an elevated potential threat. An oil price spike or supply disruption is the one closely associated event almost always present as the stock market peaks. Given this analysis, maintaining equity positions but not extending further seems a prudent course going into the end of the year. Additionally, letting more portfolio revenue bleed to cash, as well as building a stronger cash base by selling low quality equity positions at high relative prices is also where I think investors should be focused. As the relative direction of the four forces - Fed Policy, Fiscal Expenditure Growth rate, GDP growth sustainability and Geo-political conflict impact on energy supplies – continues to work against the market, the risk will continue to build that the Bull market is about to be knocked down. If you are concerned about unexpected market events like international energy supply disruptions, buying some put options on a major market index while the VIX is showing low implied volatility is a possible way to keep your positions in tact while awaiting the impact of what I expect to be a Fed and Fiscal policy shift going into 2015. Daniel Moore is the author of the book Theory of Financial Relativity. The Theory is the fundamental basis for the analytical model utilized in this article. All opinions and analyses shared in this article are expressly his own, and intended for information purposes only and not advice to buy or sell.